The food choices I've made this weekend are moving me VERY FAR AWAY from my weight loss goals. I have lost my dang mind. So I guess tomorrow is back to the basics... again. I am prepared, good food stocked. I have two weeks left of this month and I am getting it together OR ELSE. I REFUSE to undo all I've worked hard for. Stress isn't worth it. I am worth more. My gym bag is packed, and I'm about to go pack my lunch and supplements. I feel horrible, and that, in itself, is motivation to stop the madness. Hollie, my food choices have also left a lot to be desired lately. But... my holiday finishes today so I'm hoping that the routine and normality of work will get me back on the straight and narrow! I am regular follower of your blogs. your blogs a re really interesting to read thanks for sharing such a nice blogs. I had a big oops last week too. Must be spring fever. It is true, you really feel like you have lost your mind and wonder after the binge, why! I got back on track fast and so can you. Just remember what it feels like when you are eating right and exercising. We all have good and bad days. Don't worry just keep on trying. Yeah, we're in the same boat. I had hot fries for dinner. Really? O_o But I'll say it again and again...persistance, not perfection. We got this. I like your thoughts and yes nutrition is probably the number one factor to being skinny like we want. There are many ways to control it but also ways to ruin it. Support is probably number 2 and physical workout is also important. Keep up the work, this is a marathon not a sprint and keep working. Set short term goals that will get you to your long term goal. I very well can relate to the topic, though i am in India and my food habits differ and the weather condition and everything else. But what is constant is that here in India too , people tend to put back the weight they have lost over a period of time. As life went on and i got busy with college and education , i also had lesser time to spare for my workouts and walks. I again started gaining weight but this time it was slow but a steady way of weight gain. In 2004 i was 65kgs and 2007 right up to where i started 82kgs. in 2010 i was successfully down to 62kgs and i got married that year and was on top of the world. loved the way i looked and my body…. In 2011 i started putting on weight again, again no time to exercise and control on food was bad.. today i am back to being 83kgs and i am again trying to lose the excess weight. this time i also have PCOS( hormonal disorder).. i had it right from my puberty but i feel it makes it more difficult to lose weight once in my 30′s. our bodies resist efforts to drop the extra pounds. And if we do manage to get them off, our bodies react as if they need to put that fat back on. Just wanted to share my story as it is no different from people across continents. Love this! We have ALL been there. Just remember one meal at a time, one day at a time. 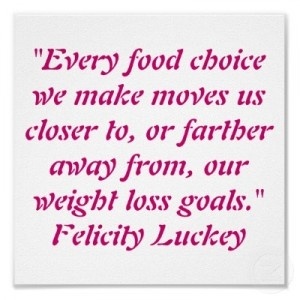 We all slip up, just have to get back to the healthy choices! :) You got this! great quote! so simple, and so true. thanks for sharing it.